The Ohio legislature is currently pushing through two separate abortion restrictions bills that are vying to hit Governor John Kasich’s desk before the 2016 session comes to an end. HB 69, what supporters have labeled “The Heartbeat Bill” would “generally prohibit an abortion of an unborn human individual with a detectable heartbeat.” The Heartbeat Bill would effectively make any abortion procedure after the first few weeks of conception illegal. HB 69 was passed by the House last year but the Ohio Senate never voted on the bill. Today, the Senate voted to pass the bill. It will now head back to the House where it will likely pass. TV ads have been airing targeting Senate President Keith Faber (R., Celina), who has refused to move the bill, as well as state Sen. Larry Obhof (R., Medina), who will replace Mr. Faber as president next session. “Tell Senator Faber to [b]ring the Heartbeat Bill to a vote or forever be known as the one who killed the most protective pro-life bill in the Ohio Senate,” reads an email sent by Janet Folger-Porter, president of Faith2Faith. If the bill does not pass the House, then it will effectively die and have to be reintroduced next session. This recent incarnation of the bill is the third time it’s been introduced in the Ohio legislature. But HB 69 has some anti-choice competition. As the House was passing the heartbeat ban, the Ohio Senate was passing SB 127, which would ban most abortions after 20 weeks of gestation. The 20-week ban has never passed the House and backers of that bill are currently working to move the legislation through the lower chamber. Ohio Right to Life told the Blade that the group is “putting all of our focus on the 20-week ban.” Currently, Ohio’s law bans abortion after 24 weeks. If the 20-week ban ends up on Governor Kasich’s desk, it’s likely that he will sign the legislation. Kasich has never seen an abortion restriction that he wasn’t eager to sign. During his tenure as governor, he’s signed roughly sixteen anti-abortion measures into law. As a result, numerous clinics in Ohio have closed. So, in the weird dystopia of Ohio politics, there are currently two competing anti-choice bills moving back and forth between the two chambers, both sponsored by different far-right anti-abortion groups. There is, of course, the possibility that both of these bills could pass, rendering some Atwoodian universe where abortion is doubly illegal but that seems unlikely. The 20-week ban seems the most plausible of the two since it seems to be one of the favorite legislative restrictions pushed by anti-choice groups post Hellerstedt. Numerous states have either passed or are looking to pass similar legislation. 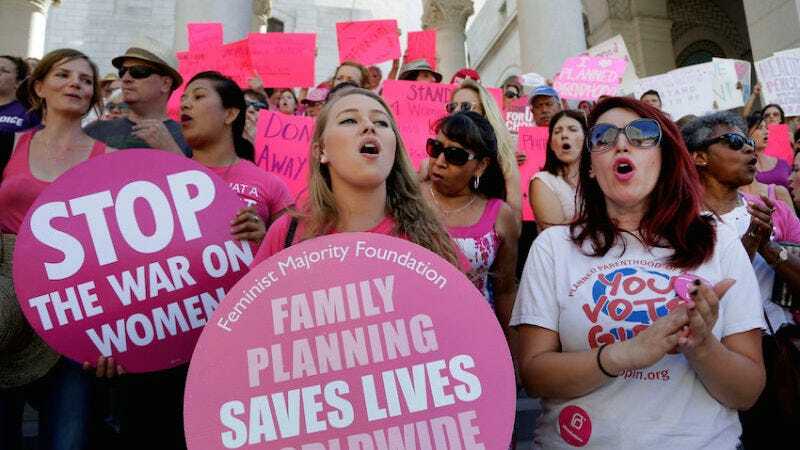 Earlier this month, Planned Parenthood and its allies filed a lawsuit in North Carolina, challenging the state’s 20-week ban. Update: The Ohio legislature has passed the Heartbeat Bill. It now heads to Kasich’s desk. According to a representative for Planned Parenthood, the bill was tacked onto legislation that addresses procedures for reporting child abuse.